How's this for inspiration!!!! This is summer at it's finest!! I made a little card that is just "happy summer" time! I am entering this card into the Simon Says Stamp Wednesday Challenge for this week which this picture inspired. I used Hero Art's stamp set Life of the Party! I stamped the darling ice cream cones on different pattern papers along with the fun ticket. I cut out by hand and pieced together. The paper is from Simple Stories' Summer Fresh. The happy summer sentiment is from Papertrey Ink's Flipping Out. I used a sticker as well from Summer Fresh. The sentiment is stamped on burlap and I added a red button. The card base is kraft cardstock from PTI. A twine bow was added at the top! 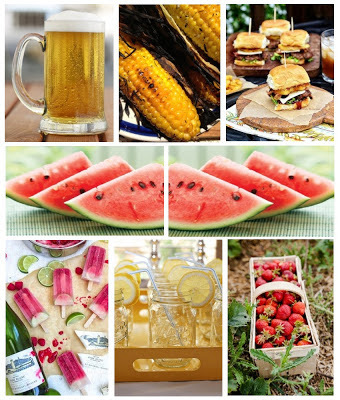 Hope everyone out there is having a great summer and enjoying some of the great foods of summer! So cute. I just got that soda pop stamp last week. Very cute elements, and I love the burlap tag, too! Great card!